Another threat from Iran… Is anyone keeping count? Addressing thousands of Iranians in a ceremony here on Saturday to commemorate the birthday anniversary of the Shiite Muslims’ first Imam, Hazrat Ali (PBUH), the Supreme Leader viewed establishment of the Islamic Republic as a continuation of the path of Imam Ali, and said that the identity of the Islamic Republic ruling system is based on the goals of the Shiites’ first Imam, including justice-seeking and confrontation with oppression, bullying and discrimination. “And that’s why oppressors and owners of wealth and power, which are oppressing mankind through their hypocritical propaganda and in the name of democracy, freedom and human rights, have entered conflict and confrontation with the Islamic Republic,” he underlined. Ayatollah Khamenei further viewed resistance of the Islamic Republic against the Zionist network of the world bullying powers as a manifestation of the path and goals of Imam Ali (PBUH). 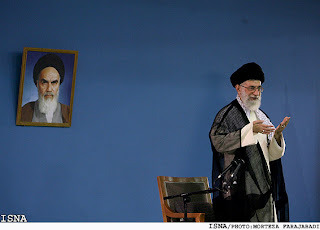 “Through gaining a full understanding of this path, pursuing justice and religion and resorting to the efforts, struggles and methods of the Late Imam Khomeini and showing full resistance against bullying enemies, everyone of the Iranian people and officials will continue the path of Imam Ali – as the only way to materialize the great national ideals and cause (of the Islamic Republic) and achieve glory, grandeur and honor – and help the Islamic Republic of Iran get further closer to the main paradigm which is the path of Imam Ali (PBUH),” he underlined.